Pools – The pool at Dreams Punta Cana is one of the largest in the Dominican Republic. The free-form pool begins near the lobby and stretches to the beach, winding through the resort grounds. 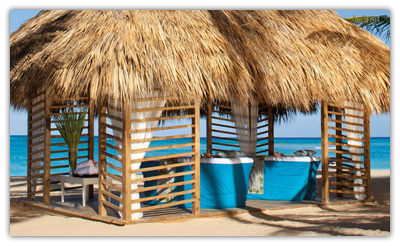 Complimentary lounge chairs, towels, and umbrellas are provided throughout the pool areas. 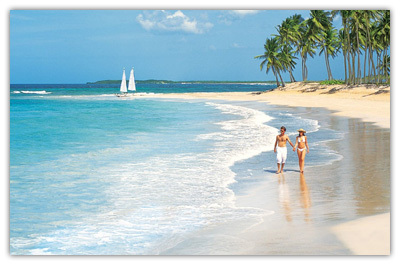 Beach – The beach is spectacular with soft, white sand and gentle turquoise waters. Enjoy a stroll on the powdery sand, take a swim in the ocean waters, try your hand at the available water sports, or just relax and lounge in the warm sun. Golf – Punta Cana offers an amazing environment for golfing with beautiful views and courses designed by top names from around the world. Nearby courses include Punta Espada Golf Club, Cocotal Golf & Country Club, Punta Blanca Golf Course, and Punta Cana Resort & Club. A concierge can assist in arranging tee times and transportation to any of the local courses. Water Sports – Non-motorized water sports are included with your Unlimited Luxury Plan. Try your hand at catamaran sailing, kayaks, windsurfing, hobie cats, snorkeling, or an introductory scuba class in the pool. Motorized water sports or scuba diving excursions can be arranged for an additional fee. Meeting Facilities – The Dreams offers more than 4,100 square feet of flexible meeting space. The state-of-the-art meeting facilities include a large ballroom, a large terrace, beach areas, and a full service business center. Casino – The casino at the resort is open from 4:00pm – 3:00am and offers a variety of gaming including blackjack, roulette, poker, and slot machines. Entertainment – The Dreams provides a theater with live entertainment each evening. 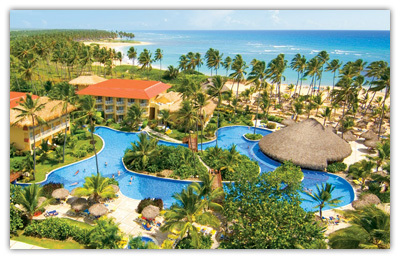 There are also exciting theme nights and the Dominican Market, where you can purchase handicrafts, jewelry, and more. Spa – The Dreams Spa by Pevonia offers a variety of treatment options. Indulge and pamper yourself while away on vacation. Enjoy massage therapies, facial treatments, and body wraps and scrubs. Spa packages are available for the ultimate indulgence. Treatments for children and teens are also available. The full-service beauty salon offers manicures, pedicures, hair cuts and treatments, and more. Fitness Center – The state-of-the-art fitness center features cardiovascular equipment and weights, providing the perfect opportunity to stay in shape while away on vacation. 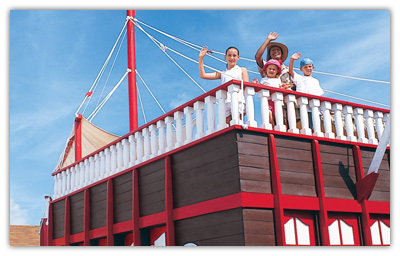 Kids Club – The Explorer’s Club provides supervised entertainment for kids age 3 – 12 years old. Activities include arts and crafts, playground, pirate ship water slide, indoor game room, storytelling, music, splash fountain, treasure hunts, sandcastle contests, hiking, board games, video games, big screen movies on the beach, kids stage, and weekly campout adventures. All staff members at the club are American Red Cross certified, and parents are given a pager so they may easily be reached. The Explorer’s Club is available from 9:00am – 10:00pm. Core Zone – The Core Zone Teen Club is designed for teens age 13 – 17 years old. Activties include social events, weekly bonfires, disco mixers, a snack bar, video games, rock climbing wall, basketball, a batting cage, archery and pistol ranges, pool, ping pong, foosball, Euro-bungee, and an internet center (surcharge). The Core Zone is available from 9:00am – 12:00am. Other Activities – Daily activities at the resort include ping pong, basketball, beach and pool volleyball, bocce ball, jogging trail, darts, giant chess, board games, yoga classes, stretching classes, aerobics, beach football, dance lessons, cocktail and cooking lessons, Spanish lessons, ocean trampoline, baseball cage, archery and pistol ranges, inflatable climbing iceberg, beach olympics, mexican bingo, and more.